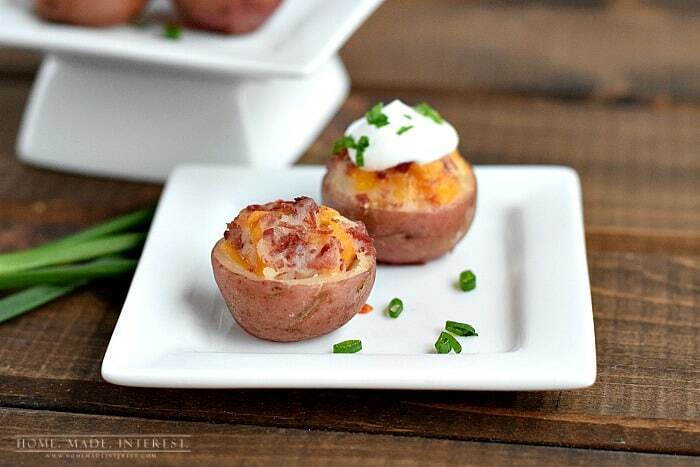 Irish Potato Bites are little twice baked potatoes filled with cheese and corned beef. 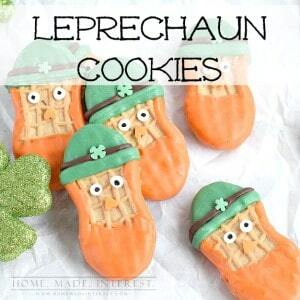 Great for celebrating St. Patrick’s Day! Hi, we’re Kat & Melinda from Home. Made. Interest. and we’re filling in for Julie today! It’s almost St. Patrick’s Day and I’m all about corned beef. It’s pretty much the only time of year I eat it so I try to come up with as many ways to use it as I can. This year I’ve stuffed it in my Irish Egg Rolls and used some of the extra corned beef to make these awesome Irish potato bites. 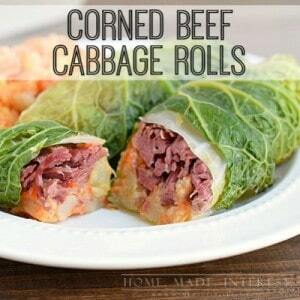 These little bites of corned beef goodness were simple to make and they can be made ahead of time and frozen, then popped into the oven to bake when you are ready to serve them. You start by boiling small potatoes until they are fork tender. Once they are cooled cut them in half and then cut a small piece off of the rounded bottom so they will sit up nicely. Use a small spoon, or a melon baller if you have one, to scoop out the middle. 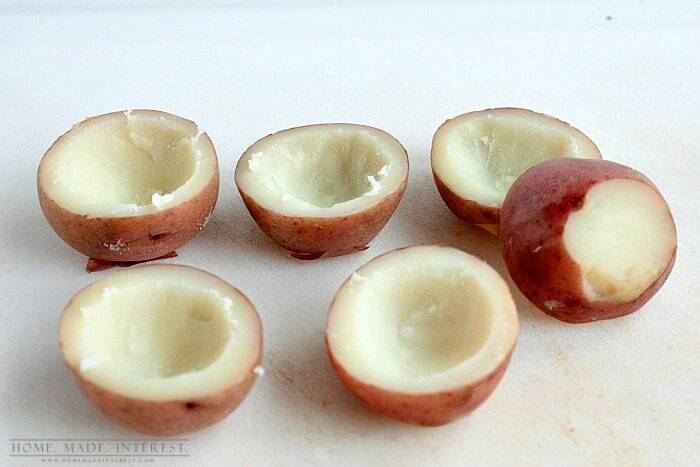 Save the scooped out potato in a small bowl for later. Once all of the potato halves are scooped out, take that bowl of saved potato centers and add to it 1/4 cup cheddar cheese, 1/2 cup of diced corned beef, and 1 tablespoon of melted butter. Press the mixture into each potato half and then place them on a baking sheet and pop them in a 400°F oven for 10 minutes. What you end up with is a delicious little bite of cheesy corned beef goodness. Add a dollop of sour cream or don’t. Either way, I promise you they are going to be a hit! Add potatoes and boil until they are fork tender, about 10 minutes. 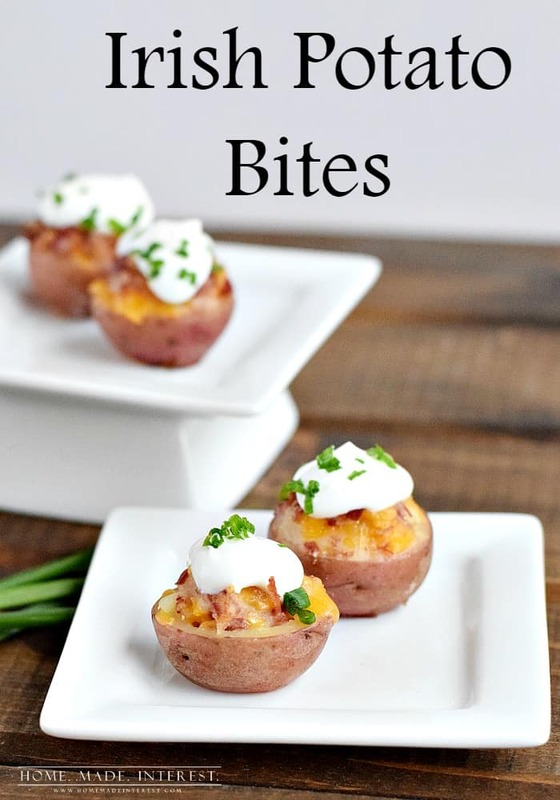 Once potatoes are cooked and have cooled, cut each one in half and cut a small slice off of the rounded end so the potato can sit up on a flat surface. Add cheese, corned beef, butter to the bowl with the saved potato insides and mix together until well combined. Salt potato mixture to taste. Also, sprinkle some salt over the potato halves. 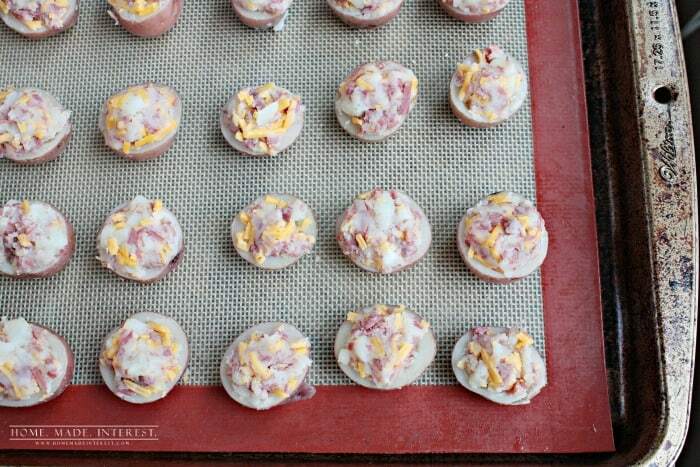 Scoop mixture into potato halves and then place them on a baking sheet lined with a silicone mat or parchment paper. Remove from oven and serve with a dollop of sour cream, if desired. You can get more amazing recipes, DIY, and craft ideas from Home.Made.Interest. on Facebook, Pinterest, and Twitter too!